Blue Ocean Strategy provides a number of interesting lessons and insights into generating a new market strategy for your business. Rick is available to lead a small team discussion - excellent for small business teams looking to generate new open markets and create demand for their products and services. Receive a free pdf of Rick's complete analysis - put Blue Ocean Strategy in the subject line. red oceans - overcrowded markets, boundaries defined and accepted, products become commodities, cutthroat competition, must beat the enemy to succeed, price wars. Slow growth unless the industry is growing. blue oceans - untapped market space, demand creation, opportunity for highly profitable growth, competition irrelevant; achieved by chasing differentiation and low cost simultaneously. Sustainable based on barriers of conventional strategic logic of the competitor, brand image conflict of the competitor, natural monopoly due to size of market, patents, high volume cost advantages, network externalities (high volume of buyers/users), business practice innovations necessary, loyal following due to value. strategic move - the set of managerial actions and decisions involved in making a major market-creating business offering. value innovation - instead of focus on beating competition, focus on creating a leap in value for buyers thereby making competition irrelevant; equal emphasis on value and innovation - without innovation it is value creation which is incremental value improvements based on technology, marketing, or futuristic and not truly blue ocean; innovation must align with utility, price and cost positions; system strategy approach that achieves a leap in value for buyers and the company; market boundaries and industry structure are not given and can be reconstructed by actions and beliefs. strategy canvas - an analytical framework - diagnostic by showing current market and actionable by showing new possibilities - this is done by plotting the value curve; clearly depicts the traditional factors that affect competition among industry players as well as new factors that lead to creation of new market space. Continuous monitoring of the strategy canvas will signal when to value-innovate towards a new blue ocean. value curve - graphic depiction of a company's relative performance across its industry's factors of competition as shown on the strategy canvas. If at high levels across all factors, and market share / profitability doesn't reflect investment, then the company may be oversupplying its customers by offering too much of those elements that add incremental value to buyers - eliminate and reduce to construct a divergent value curve. If spaghetti pattern then company strategy isn't coherent - independent substrategies - divisional or functional silos. strategy shift - reorienting your strategic focus from competitors to alternatives and from customers to noncustomer of the industry; redefine the problem and construct buyer value elements that reside across industry boundaries. four actions framework - which factors the industry takes for granted should be eliminated; which factors should be reduced well below the industry's standards; which factors should be raised well above the industry's standard; which factors should be created that the industry has never offered. First two statements drop the cost; the second two lift buyer value and create new demand. the strategy grid - create a square broken into four pieces - eliminate, reduce, raise, create matches the four actions framework. Benefits: simultaneously pursue differentiation and low costs; flags focus problems on one sector (typically raise & create causing overengineering); easily understood by all increasing level of engagement; challenges thinking and increases discovery. good strategy - the strategy grid creates a good strategy with three characteristics: focus, divergence and a compelling tagline. Becomes the initial litmus test of commercial viability of blue ocean ideas. strategic focus - the resulting value curve does not diffuse its efforts across all key factors of competition (ie - what's different about your value curve - example of southwest friendly service, speed, frequent point-to-point departures). Non-focus has high cost structure and business model with complex implementation and execution. strategic divergence - a value curve that stands apart - designed from the strategy grid and not from reactive competitive pressures. Non-divergence is a me-too strategy and no marketplace uniqueness. strategic compelling tagline - clear-cut and advertises a company's offering truthfully (else customers will lose trust and interest). Non-compelling tagline is from an internally driven product or innovation for innovation's sake and not the customer - typically will have terms stated in company jargon instead of terms buyers can understand and value. Rick has further analysis on the six strategy principles, the six paths framework, the four steps of visualizing strategy, three tiers of non-customers, tipping point leadership, and fair process. 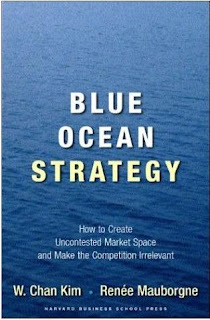 Receive a free pdf of Rick's complete analysis - put Blue Ocean Strategy in the subject line.